Well it's Works For Me Wednesday time and I have a tip for the cake baker in every family. Dontcha love when your cake slides right out of the pan so you can tier it up and decorate it? But don'tcha hate that as a result your cake turns out white on the sides and bottom? Well, no more . . .
tip #1: Instead of using oil or shortening, use cooking spray. You'll end up with a lot less of a mess and the calories/fat content is reduced dramatically. 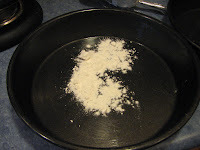 tip #2: Instead of using flour, reserve a couple of table spoons of the cake mix and use that to coat the cake pan. Your cake will still slide right out of the pan and no messy looking flour at the bottom! It's a win-win! Works beautifully. And it definitely Works for Me! You are a genius! I will definitely try this next time I make a cake. I have a feeling I have a lot of baking in my future with spring break coming up and the kiddo home for 2 weeks. Thanks for the inspiration! Come by and see me sometime over at Free 2 Be Frugal.